The following is based on a wide-ranging telephone conversation between Daren Hansen, J. J. Keller’s Senior Editor for Transportation Safety, and Joe DeLorenzo, the Federal Motor Carrier Safety Administration’s Director of the Office of Compliance and Enforcement. The conversation took place on Tuesday, November 21, 2017. The answers are paraphrased. Q: The FMCSA announced that it will be issuing a 90-day waiver from the ELD mandate for drivers in the agricultural industry, with the primary concern being livestock haulers. Will the waiver actually apply to virtually anyone involved in hauling agriculture-related cargo, including farm supplies as referenced in Sec. 395.1(k)? A: No. The new waiver will only apply to the transportation of “agricultural commodities” as defined in Sec. 395.2 – including livestock – and will not extend to “farm supplies for agricultural purposes” or other commodities. Q: The current ag exemption in 395.1(k) is limited to 150 air miles. Will there be any distance limitation on drivers using the 90-day ELD waiver? A: No. Eligible drivers will be able to use the ELD waiver no matter the distance driven. Q: Will drivers using the 90-day ELD waiver also have an additional 90 days to purchase and install an automatic on-board recording device (AOBRD) and have it “grandfathered” until December 16, 2019? A: No. The grandfathering deadline in Sec. 395.8(a) will not change for drivers using the 90-day waiver. They must install and use the AOBRD by December 18, 2017, in order for it to be grandfathered. Q: Will the agricultural hours-of-service exemption in Sec. 395.1(k) be amended based on upcoming FMCSA guidance on how the exemption applies? A: No. The exemption was issued by Congress and is mandated, as written, in law. However, the FMCSA has some leeway to interpret how the exemption applies. The upcoming guidance will, to some extent, expand the number of drivers eligible to use the exemption. Q: The ag exemption covers the transportation of “non-processed food.” Does the FMCSA consider raw milk to be a “non-processed food”? Q: How will ELD violations be “screened out” of the CSA scoring process? A: The ELD regulations are found in sections 395.20 through 395.38. If a driver is cited for violating one of those rules prior to April 1st, whether they have an ELD or not, the citation will appear on the inspection report but will not carry any severity points in the CSA system. Q: How will failure to have an ELD be cited? A: Section 395.22 will be used to cite “no ELD” violations prior to April 1st. Because that section is found within the ELD rules, it will not carry severity weight in CSA. On and after April 1st, “no ELD” violations will be cited under section 395.8(a), the same as having no logs, and CSA points will be assigned. Q: If a driver gets cited only for failure to have an ELD before April 1st, will that be treated the same as a “clean” or “no violation” inspection for the HOS BASIC in CSA? If so, doesn’t that punish drivers/carriers using ELDs who have a “minor” ELD violation, like failure to have eight blank logs in the vehicle? A: If the only violation cited on an inspection report before April 1st is for an ELD violation, it will be treated the same as any violation that is not tracked in CSA and that has no severity points attached to it. This means all drivers will be treated the same, because a driver using an ELD who gets cited for an ELD violation before April 1st will not receive severity points for that either. Q: Will officers be trained on the differences between AOBRDs and ELDs so they’re not demanding something from an AOBRD user – such as an electronic data transfer – that an AOBRD system is not required to provide? A: A lot of training was done on this, including extra training for at least one “point person” in each jurisdiction who can train others and answer questions. However, it will still be vital for drivers to know their systems, know what the requirements are, and know how to communicate that with enforcement. One key part of that is the instruction card that drivers are required to carry, both for AOBRDs and ELDs. Q: There are bound to be some technical glitches that result in problems with data transfers from an ELD. How much patience will officers have? Will they hassle drivers for things taking too long or if something doesn’t work? A: This will come down to the officer’s discretion for the most part. Their number one option will be asking for a data transfer. If that doesn’t work, they will turn to the backup method: either the ELD display or a printout. How long they try to get the transfer to work will be up to them. 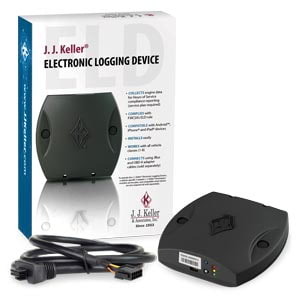 Start your transition to ELDs today with J. J. Keller® E-Logs – compatible with iPad®, iPhone® and Android™ mobile devices. Affordable, flexible options from the nation’s most respected transportation solutions provider.